1-We find rest in those we love, and we provide a resting place in ourselves for those who love us. 2-Ingratitude is the soul’s enemy… Ingratitude is a burning wind that dries up the source of love, the dew of mercy, the streams of grace. 3-If you would know whether you have made a good confession, ask yourself I you have resolved to abandon your sins. 4-The three most important virtues are humility, humility, and humility. 5-There are those who seek knowledge for the sake of knowledge; that is curiosity. There are those who seek knowledge to be known by others; that is vanity. There are those who seek knowledge in order to serve; that is Love. 6-Love seeks no cause beyond itself and no fruit; it is its own fruit, its own enjoyment. I love because I love; I love in order that I may love. 7-Spiritual life is like living water that springs up from the very depths of our own spiritual experience. In spiritual life everyone has to drink from his or her own well. 8-God removes the sin of the one who makes humble confession, and thereby the devil loses the sovereignty he had gained over the human heart. 9-Prayer is a virtue that prevaileth against all temptations. 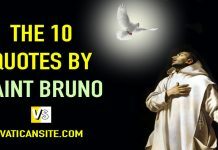 10-It is a fault, not a virtue, to wish your humility recognized and applauded. 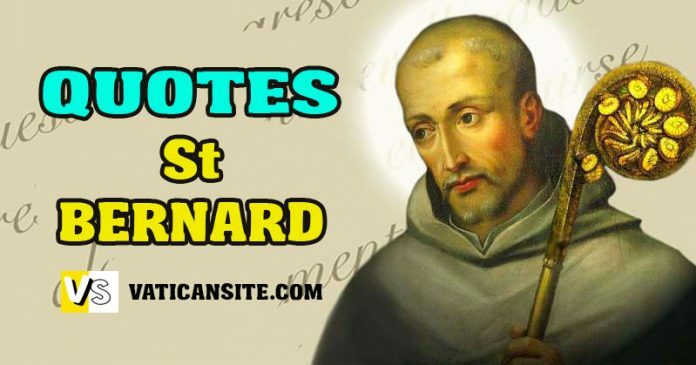 St. Bernard of Clairvaux, the second founder of the Cistercians, the Mellifluous Doctor, the apostle of the Crusades, the miracle-worker, the reconciler of kings, the leader of peoples, the counselor of popes! 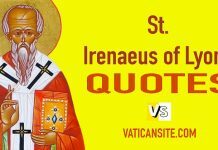 His sermons, from which there are many excerpts in the Breviary, are conspicuous for genuine emotion and spiritual unction. The celebrated Memorare is ascribed to him. Bernard was born in 1090, the third son of an illustrious Burgundian family. He was of a noble family and received a careful education in his youth. At the age of twenty-two, with his father, brother and thirty noblemen he entered the Benedictine monastery of Citeaux (where the Cistercian Order had its beginning) and persuaded thirty other youths of noble rank to follow his example. Made abbot of Clairvaux (1115), he erected numerous abbeys where his spirit flourished. The monastic rule which he perfected at Clairvaux became the model for 163 monasteries of the Cistercian reform. To his disciple, Bernard of Pisa, who later became Pope Eugene III, he dedicated his work De Consideratione. Bernard’s influence upon the princes, the clergy, and the people of his age was most remarkable. He was a theologian, poet, orator, and writer. By penitential practices he so exhausted his body that it could hardly sustain his soul, ever eager to praise and honor God. St. Bernard died during the year of 1153 in Clairvaux, France. He is sometimes considered as a Father of the Church. 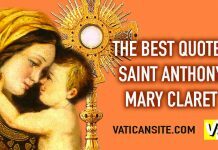 #PRAYER TO #OURLADY #MARY BY #SAINTBERNARD – Look to the star, call upon Mary.